March 27, 2015 March 31, 2015 ~ Trevis Dampier Sr.
Well my buddy at work JP mentioned that he went there earlier today so I figured I would give it a try since I remembered they had a great salad over there. 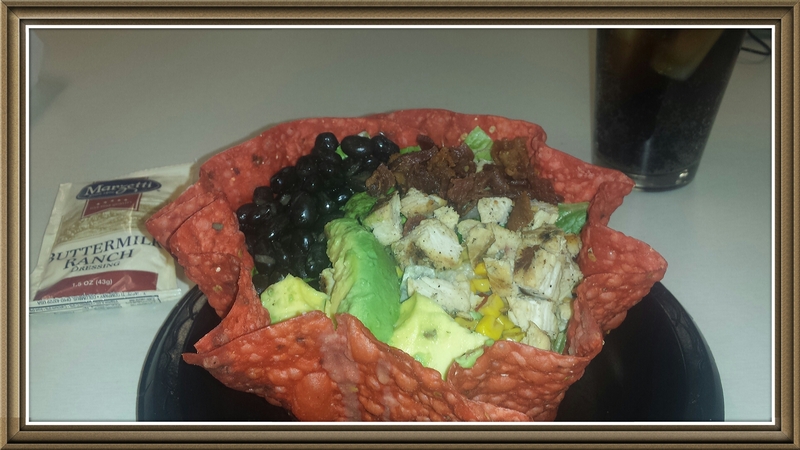 I agreed with myself and got the SouthWest Chicken Avocado Tostada which is nestled in a crisp flour tostada shell, filled with chopped romaine lettuce blend, pinto beans, rice, pico de gallo salsa, fresh avocado slices, fire-grilled chicken breast and delicious succulent bacon. You also have your choice of Ranch, Creamy Cilantro Dressing or a Vinaigrette for the sauce and it will be in a separate vile or packet so no worries on it being flooded with wetness. One thing you will notice is how flavorful the bowl is even before you place the sauce on it so you may not even need to use a lot of it. The pinto beans add a moistness to the salad already which the shell soaks in just enough to where it is not hard to break through the bottom while your ravaging through this appetizing meal. The rice has a great punch of flavor to it as well, along with the succulent bacon and the finger-licking chicken which really makes every bite a pleasurable sensation to your palate. I make sure to keep a bottle of Tapatio hot sauce at my desk, which I highly recommend for Mexican or Spanish dishes, and I added a bit of that to it as well. I took a bite with my fork and boom!! A slight crunch from the lettuce with the smooth texture of the avocado mixed with the pop of flavor from the black bean and then a creamy texture and pop from the pinto bean with a delicate fire grilled flavor from the chicken and succulent bite of the bacon. Yum!! That’s true live action eating! If you have never tried El Pollo Loco then I suggest you try it. It is not greasy fried food and it will leave you completely satisfied! Good job El Pollo Loco! Thanks for joining me on today’s adventure! I look forward to enjoying some live action eating memories with you this weekend! Keep hope alive! < Previous Give me a batch of Pacific Catch!!! Next > I’ll do ‘The Dance of Joy’ kickin for BBQ with Fried Chicken!